Notes: Lucille's singing voice is dubbed by Carole Cook. Lucie nor Lucille were trusted to perform musically at this point. Notes: Jackie Gleason in his Ralph Kramden personage is perhaps the single best cameo in sitcom history, running neck and neck with Suzanne Pleshette's appearance on the surprise series finale of Newhart in 1990. It is so unexpected, that when Gleason makes his entrance, he steals the entire scene. Notes: Shelly Winters' dresses were padded to make her appear bigger then she really was. This is done so in the final scene, she appears thinner in her new black dress. Notes: Don Chrichton is one of the regular dancers and bit players on The Carol Burnett Show (1967-78). Notes: Lucy's impersonation of a Middle Eastern royalty comes directly from I Love Lucy episode #31, "The Publicity Agent." This episode is actually a satire of Mission: Impossible, which aired from 1966-73 and originally produced by Desilu. 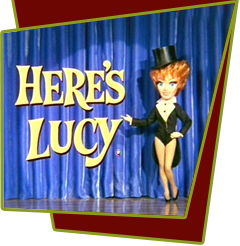 Notes: The name of Von Kirsten's next book, Life with Lucille, is awfully close to the actual name of Lucy's final television series.